In this excerpt from The Age of Spiritual Machines (Viking, 1999), Ray Kurzweil describes his work in speech recognition. 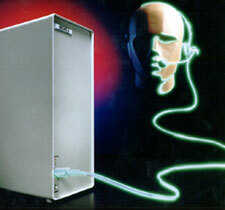 I also started Kurzweil Applied Intelligence, Inc. in 1982 with the goal of creating a voice activated word processor. This is a technology that is hungry for MIPs (i.e., computer speed) and Megabytes (i.e., memory), so early systems limited the size of the vocabulary that users could employ. These early systems also required users to pause briefly between words... so.... you.... had.... to.... speak..... like.... this. We combined this "discrete word" speech recognition technology with a medical knowledge base to create a system that enabled doctors to create their medical reports by simply talking to their computers. Our product, called Kurzweil VoiceMed (now Kurzweil Clinical Reporter), actually guides the doctors through the reporting process. We also introduced a general purpose dictation product called Kurzweil Voice, which enabled users to create written documents by speaking one word at a time to their personal computer. This product became particularly popular with people who have a disability in the use of their hands. Just this year, courtesy of Moore's Law, personal computers became fast enough to recognize fully continuous speech, so I am able to dictate the rest of this book by talking to our latest product, called Voice Xpress Plus, at speeds around a hundred words per minute. Of course, I don't get a hundred words written every minute since I change my mind a lot, but Voice Xpress doesn't seem to mind. We sold this company as well, to Lernout & Hauspie (L&H), a large speech and language technology company headquartered in Belgium. Shortly after the acquisition by L&H in 1997, we arranged a strategic alliance between the dictation division of L&H (formerly Kurzweil Applied Intelligence) and Microsoft, so our speech technology is likely to be used by Microsoft in future products.